EL SEGUNDO, Calif. (April 27, 2017)– Today, State and local officials joined together with the South Bay business community, Wiseburn Unified School District, El Segundo Unified School District and their honored guests to officially break ground on the El Segundo Aquatics Center—the state-of-the-art swim facility that aims to put swim safety and swim sports to the forefront of the South Bay. The event also commemorated the “Fill the Pool spring fundraising initiative which brought in a wave of community support, awareness and more than 80 donations ranging from $50 to $1,000 during the three-week fundraiser. 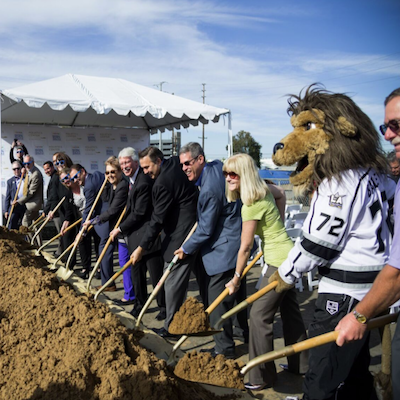 At the event, the LA Kings announced a $150,000 pledge towards the aquatics center. An additional contribution of $20,000 from Chevron El Segundo Refinery was also announced as well as a contribution from the Briney Family. The Mayor of El Segundo Suzanne Fuentes served as the emcee for the event. El Segundo city council members, school district board members, elected and former elected officials and representatives including Former L.A. County 4th District Supervisor Don Knabe, representatives from Congressman Ted Lieu’s office, Senator Ben Allen, Assemblywoman Burke’s office, and West Basin Municipal Water Board members were also in attendance for the historic groundbreaking ceremony. Supporter Sippy Woodhead, former competition swimmer, Olympic Gold medalist, and former world record-holder was also a special guest at the event. The outdoor swimming complex will provide the community with a center for competition-level swimming, community swim lessons and fitness classes and will act as the future home to local high school and adult swim and water polo teams. The main feature will be a 53.2 meter, 10-lane competition pool with an expanded shallow entry area and two moveable bulkheads, allowing for more flexible aquatics programs. To date the Aquatics Center has received major sponsorships from Kinecta Federal Credit Union, The Los Angeles Lakers Foundation, Los Angeles County 4th District, Skechers, Mar Ventures, Toyota Motor Sales, U.S.A., and Continental Development Corporation. Earlier this year, Continental Development Corporation contributed a second $1 million to the center. The center is going to launch several initiatives to help raise the remaining $2.5 million needed to complete the pool. To donate, visit DonateESAquatics.org or info@esaquatics.org. South Bay Sports, Health, and Recreation is a not-for-profit corporation dedicated to providing funding to create, upgrade, and enhance sports and recreation facilities with the purpose of promoting and cultivating improved health for the betterment of the community. Visit esaquatics.org or sbshr.org to learn more.